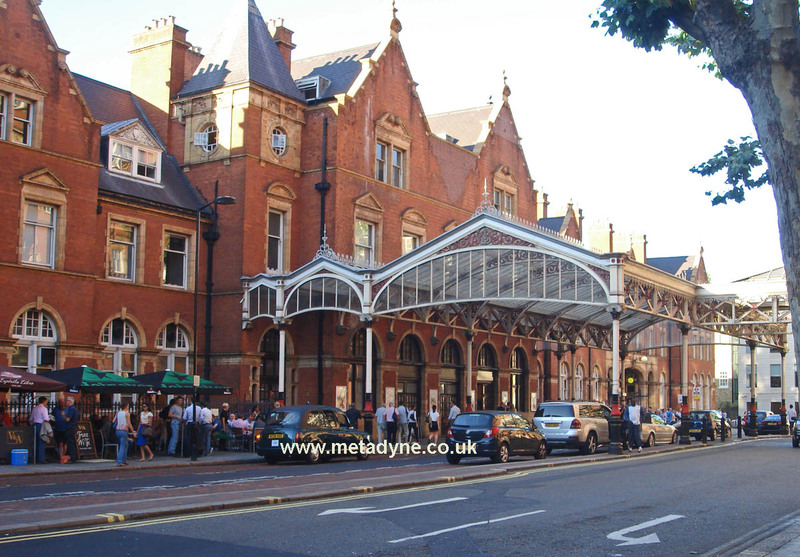 Marylebone station today – a remarkably unspoilt frontage. Betjeman thought the appearance redolent of a public library. I have until recently remained loyal to the concourse bar at Marylebone station. From early drinking days in the 1970s it was one of the few watering holes that continued to serve real ale during those dark days when in London only Youngs and Fullers establishments could be relied upon to have the stuff and pretty much every other tied house was compelled to serve glutinous fizzy beer, much of which was (in the opinion of me and many others) undrinkable. Anyone remember Watneys Red? A few pubs and bars, perhaps as few as five per cent, persisted with pumped beer and the Victoria at Marylebone was one of them. There was very little other reason to go to Marylebone. The infrequent train service operated by early 1960s slam-door diesel sets that were noisy and produced large amounts of diesel smoke were unattractive. 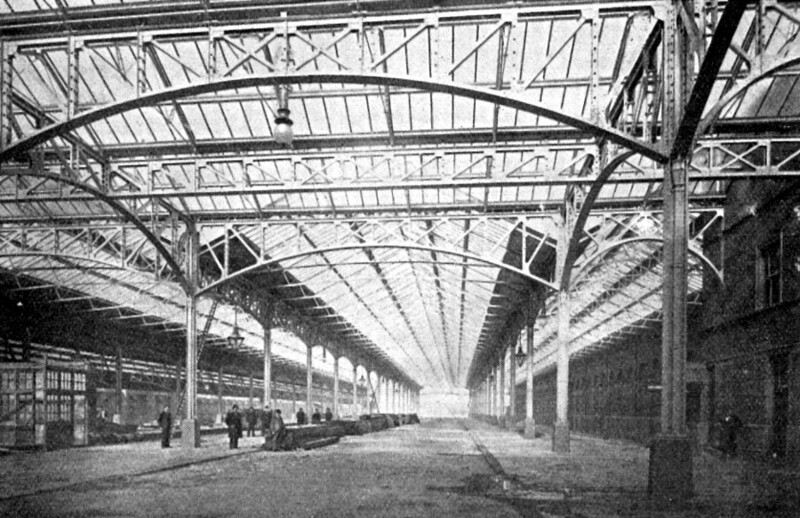 The four platforms were not used to capacity and had a derelict air. The station was not overly troubled by either staff or passengers. Like Broad Street it had seen better days and appeared to be on its last legs. A coach terminal was being investigated as a better use for the site, with rumblings that the approach railway could be turned into an express coachway, an idea whose impracticality achieved near legendary proportions. The feeble service that clattered out to Ruislip and Wycombe could be switched to Paddington. The Aylesbury traffic could by some very inconvenient mechanism be switched to Baker Street, probably by forcing passengers to change trains at Aylesbury or Harrow since London Transport had little enthusiasm for going to Aylesbury. So far as Marylebone was concerned, the end was nigh. There really is not very much going on in this 1969 photo. On the right hand side may be seen the tower of Melbury House. 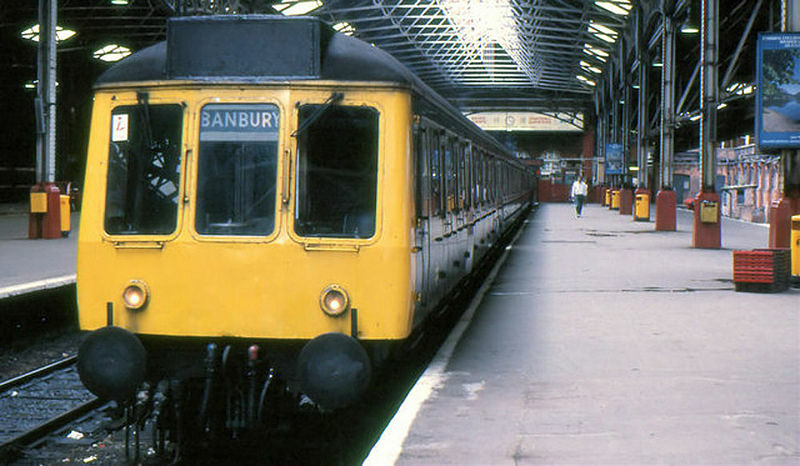 The front of the train in platform 4 is approximately in the position where, behind the wall, the GCR refreshment department depot was located. This was the designated platform for long distance departures that included restatuarant cars and it was apparently possible for stocks to be loaded to the catering cars via the offside, direct from the depot (for which purpose a platform must have been provided). For many years, in the next block south, the GCR stables for cartage traffic was located, next to the parcels office. Copyright High Llewelyn, Creative Commons. I could sit occasionally with my pint in the Victoria Bar watching decay set in and wondering when the closure announcement was to be made, but we all know it didn’t happen like that. Closure was problematic and dragged on long enough for Network SouthEast to arrive and the world changed. The rest is history, as they say. 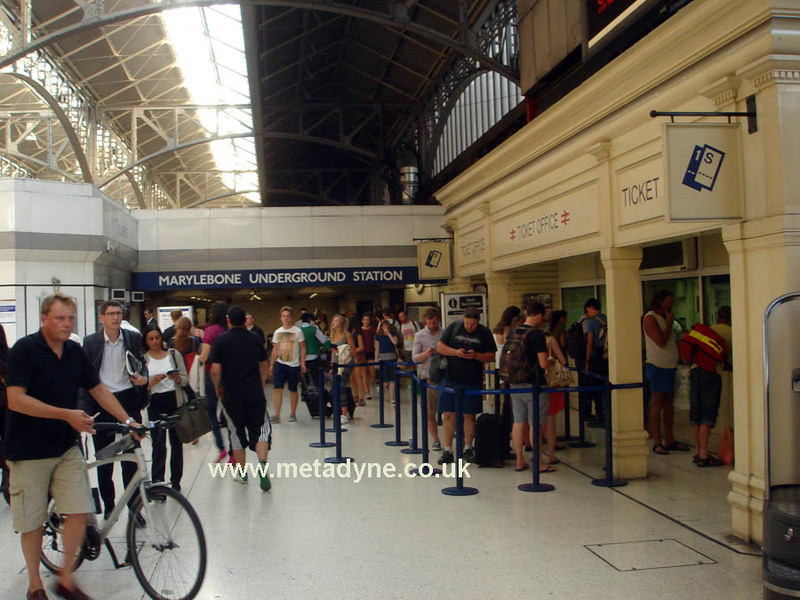 We know what Marylebone is like today. However there have been some strange recollections about changes to the station and the inaccuracies trouble me, so time just to set the record straight. The Manchester, Sheffield & Lincolnshire Railway (MSLR), as its name suggests, was based in the north Midlands and Lancashire but had its own train services to and from London through an arrangement with the Great Northern Railway (GNR), so its trains used Kings Cross. The relationship was a close one, it seems. I mentioned at a recent talk I gave the strange case of an ‘up’ Great Northern excursion train that failed to stop at Kings Cross in 1862, the train overrunning the buffers, mounting the concourse and trundling through the arch opposite what is now Platform 1, crossing Pancras Road (then passing outside that arch) and crashing through the Metropolitan Railway construction hoardings taking two carriages with it. (I argue these were the first fare paying passengers to travel over Metropolitan Railway property). The subsequent enquiry reveals that although it was a GNR train the guard was an MSLR man owing to the working agreement between the companies. In any event he took the rap for the incident as he was found to be insensible through drink, apparently unwisely purchased for him by passengers at Peterborough. Anyway, relying on the accommodation of the GNR for access to London when in fact it was a rival was clearly unsatisfactory; a route of its own was called for, though as the Great Western, London & North Western, Midland and Great Northern already served the area as well as London, and had built up established traffic, we can see that the case might not be compelling and the existing railways would strongly object to yet another route (and they did). Most readers will already know the MSLR chairman was Sir Edward Watkin, who also chaired the Metropolitan Railway, and that by extending the Metropolitan outwards into mid Buckinghamshire (with no prior hint of a deal with the MSLR) it proved easier immediately afterwards to get MSLR powers to meet up north of Aylesbury, the Metropolitan providing access to London. The Metropolitan seriously entertained the thought of handling all this main line traffic at Baker Street; discussions were brief and the MSLR insisted on building its own terminus a few hundred yards away, and so Marylebone Station arrived. The station opened on 15 March 1899. Land was purchased for a very extensive station that occupied the whole block between Harewood Avenue and Boston Place, though the western part of the site was not initially developed and I think leased out. In the 1950s this plot was developed as offices known as Melbury House, acting as overspill accommodation for the British Transport Commission headquarters nearby; it had an access from the station concourse as I recall. The station frontage was about 325ft wide and occupied the whole of the station approach (which formed an extension of Melcombe Place) but the platforms occupied only the eastern side, and my guess is that had the whole of the site been developed then probably at least another four platforms could have been fitted in, perhaps six. Now, the platform arrangement was not the same as we have today and I well recall the the old arrangement where there was an exceedingly wide island platform at the east side with a cab road running down the middle of it, in line with the station’s entrance arch (which is why the arch is there). 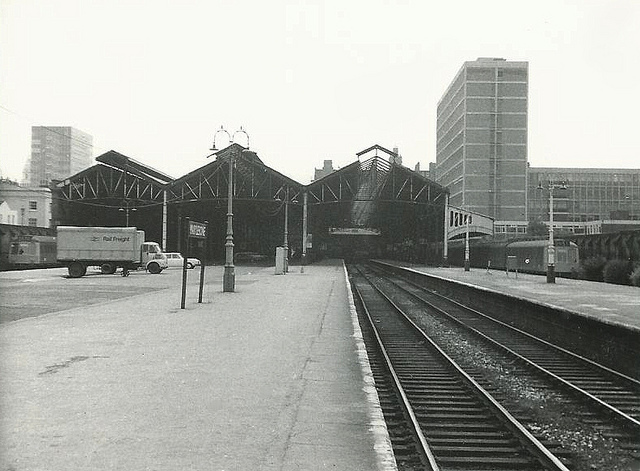 Platforms 1 was the designated arrival platform for long distance trains and the cab road was intended to allow cabs to meet them, enough space being available for a rank to be formed. Arriving cabs were intended to come down a ramp leading off the north side of Rossmore Road bridge (with a return under the bridge itself) and departed through the arch. We must recall that only cabs who had paid for the privilege could then ply for hire on railway land and it was an early job of railway police to enforce this. People arriving by cab were dropped off in the approach road under a porch outside the ticket office. It must be doubted whether the cab road was used for this purpose for very long since in 1911 it was not so used and the station was then operated as a ‘closed’ station with the cab road gated where it met the concourse. During my visits to Marylebone some of the cab road space was occupied by portacabins used by some kind of railway staff and the rest was, incredibly, used as a car park. It all looked dreadful. Marylebone 1899 looking north along cab road. Cabs arrived (towards us) from a ramp of the north side of Rossmore Road which crossed the track entering platform 4 and then passed underneath Rossmore Road bridge to meet the north end end of the platform. The road surface was of Jarrah blocks. Fieldens Magazine. Having described this wide platform it will be evident that the original platforms 3 and 4 were somewhat to the west of their present locations, separated from each other by a rather narrower island. I haven’t measured it on a map precisely, but my guess is that the north end of the original platforms 3 and 4 are pretty much exactly where today’s platforms 5 and 6 are located. An explanation is needed. When Marylebone was rejuvenated in the 1980s, the cab road was removed and the space excavated to provide two new platform spaces to be inserted, allowing, in turn, the long island on the west side to be removed and the south end sold off together with the hideous Melbury House building that lay next to it. The space at the north end of the former platforms was converted into a carriage depot to serve the new diesel units. It will be seen that, as altered, only platforms 1 and 4 are actually the original platforms (the latter being the former platform 2). These are the 1980s platforms constructed along the station’s former cab road. The archway to street is directly behind photographer. It is a terrific testimony to the vision of Network SouthEast, and later Chiltern Railways, that traffic developed so hugely, especially along the formerly moribund Great Western and Great Central Route over which trains now run to Birmingham. 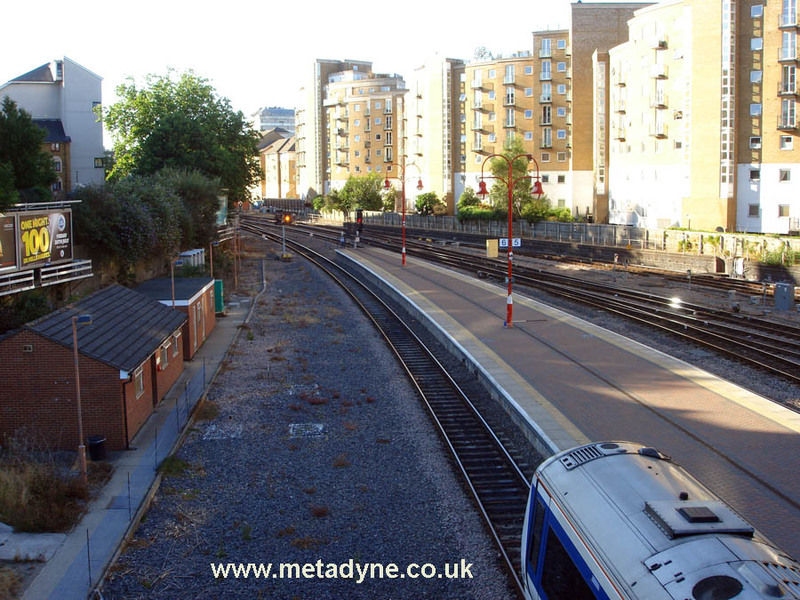 For the first time in its life Marylebone found itself short of platform space so in 2006 two more were added. Unfortunately, with all the spare land originally provided for expansion now sold off, the only space available was that occupied by the carriage depot, which was relocated to Wembley. The new platforms, 5 & 6 were built on the site (effectively reinstating the old platforms 3 & 4, though only their north ends) but the only way of getting access from the concourse was to much-shorten platform 4 so that its trackbed could be used to provide a lengthy access between the concourse and new platforms. This is rather unsatisfactory if one arrives with only a few minutes to spare for one’s train and discovers it leaves from one of the far platforms, requiring a lengthy sprint, but is probably the best that could be achieved. It is one of many examples of inconvenience created for today’s passengers by 1970s and 1980s property sell offs and should be a warning to our generation to be a bit more imaginative. Having said that, it must be recognised that selling the plot of land to the west of the platforms probably helped fund the initial Marylebone rejuvenation. Looking north from Rossmore Road are the ends of new platforms 5 and 6. The towers on the right were once all railway land, with a 2-platform milk dock on extreme right. The station turntable was just on the left, and the vast former goods shed had been just beyond that. Much of the vast goods yard was to the west of Harewood Avenue. When the Underground arrived at Marylebone in 1906 it ran underneath Melcombe Place and there was a station building on the north west corner of Harewood avenue. This station was unique. Unlike other Leslie Green buildings the station structure was of one floor only, and this housed the motor room and some staff accommodation. The ticket hall and lift entrances were in the basement, accessed by an entrance at the corner. The reason for this was that there was a long subway leading directly from the ticket hall and crossing under Harewood Avenue at an angle and crossing the main line station boundary by the parcels entrance. 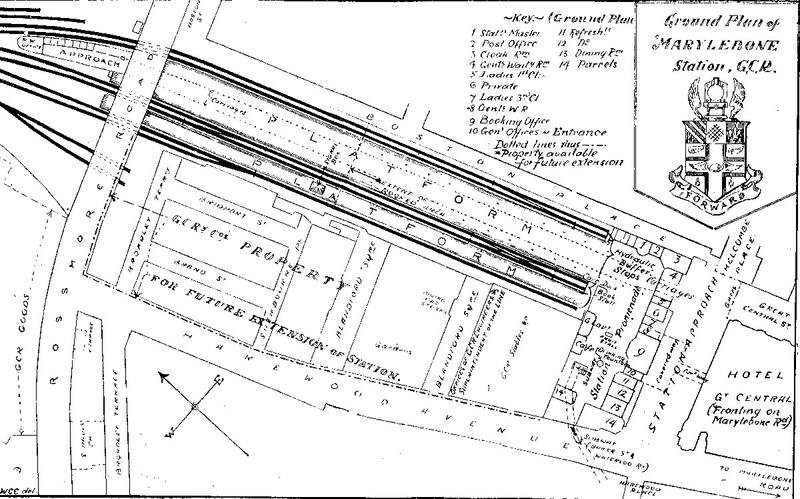 Public access was gained by stairs between the parcels yard and platform 4 and this probably comprised the busier entrance to the Underground (the steps and subway can be found on the plan at the top). 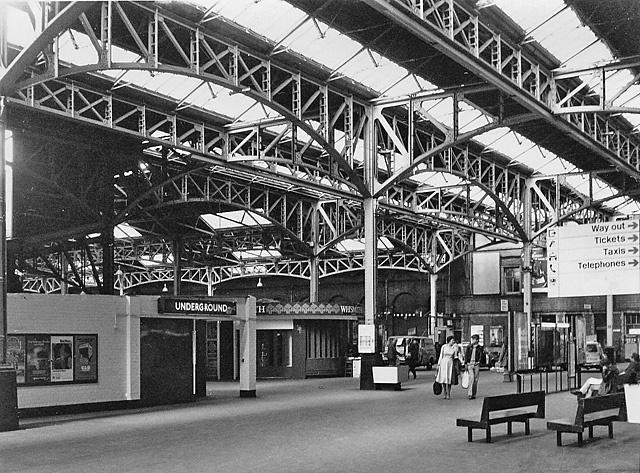 There are photographs of the original concourse entrance in 1907 HERE and in 1927 HERE, the latter showing the parcels office in the background. There is a photo of the original street entrance to the Underground in 1930 HERE. During the 1930s it became evident that the three lifts provided unsatisfactory access to the station and that escalators would be a much better solution. Site conditions were awkward at this deep station but in deciding to retain existing platform entrances and exits it meant abandoning the existing station building (I hope it is obvious that where lifts are used the entrance must be above the lower lift landing but that where escalators are used the slant means the entrance cannot be directly above unless the rise is quite small). It was therefore possible to bring the escalators up immediately west of (original) platform 4 in the knowledge (so they thought) that there would never be any additional platforms to obstruct. The new escalator shaft was far from ready when war broke out and much work had to continue as stopping it in water-bearing ground was not a good idea. It eventually opened in 1943 following bomb damage to the old building (which was retained as storage for some years until replaced by a hotel). The escalators emerged at top level along the main line station concourse within a ‘temporary’ corrugated iron enclosure that incredibly lasted for 40 years. There is a photograph of the ticket hall interior HERE. It survived until 1988. 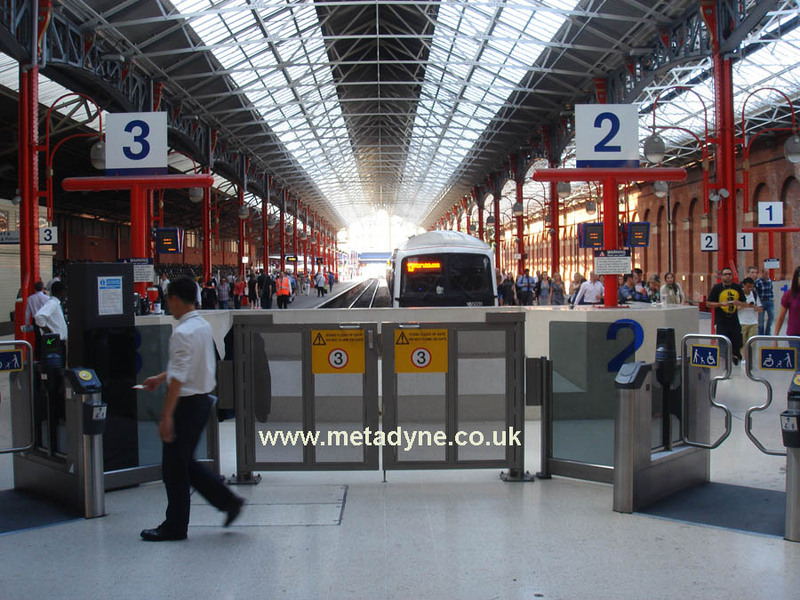 At the low level the escalators meet a curved passage which takes passengers to and from the platform steps. This is novel in that it is actually joins the north side of the old 30ft diameter lift shaft and people going to and from the platforms use the original lift entrance and exit arches on either side. During the transition period when the new subway was being built it was necessary to remove the northernmost lift so that part of the shaft could be floored over (the lift going out of service in September 1939). There had been three lifts in this shaft so the station could cope during the interim. Once the escalators had come into service the two remaining lifts could be removed and the whole of the area floored over, the supervisor’s office being built along its southern part. I cannot think of any other Underground station where a lift shaft was used in quite this way, though at Tottenham Court Road two passageways pass through former lift landings. I think the 1906 station subway was blocked off during the war to reduce risk of flooding. I cannot recall any disused stairway on the old main line concourse but have it in mind there were always ugly hoardings along this section so it was presumably behind them. It would be behind the shops now. Marylebone concourse looking towards platform area. Left, in 1980s and Right, today. It is amazing what a bit of care and attention can achieve, though the new floor is probably one of the greatest contributors to the uplift. Chris Green (who was in charge at NSE) was very keen on light coloured flooring and thought them an incentive to keep clean. (Photo on Left taken by Steve Wright 1988, courtesy flickr, copyright conditions complied with. Photo on right by author). So today Marylebone is transformed. I should have penned this from a barstool at the station bar, but unfortunately it so crowded these days that am looking for somewhere more desolate. Not easy to do in London.